Peaks and Pints adores spruce and fir tips in craft beer. 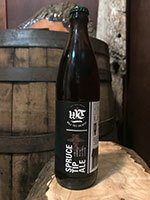 Spruce beer has a long history, especially in colonial America, and within multiple naval traditions. When Captain Cook sailed the Pacific in the 1700s his crew drank spruce beer to help ward off scurvy. Of course boiling the spruce probably destroyed all of the vitamin C making it useless as a scurvy cure, but being beer it probably helped ward off boredom and mutiny. Spruce and fir tips can either be used to bitter and flavor a beer in place of hops, or as a flavorful ingredient in addition to hops. It takes the right kind of beer to compliment the citrusy and sometimes piney flavor of the tips, but when it’s done right it can taste like beer, candy, and Christmas got together to throw a party in your mouth. Today, Peaks and Pints throws a party in your mouth with our Craft Beer Crosscut 12.6.18: A Flight of Christmas Trees. If you search for Wolf Tree Brewery, you’d be headed toward Seal Rock, a small coastal community between Newport and Yachats. But, you won’t find founder and head brewer Joe Hitselberger there. The production brewery is 6 miles inland, in a barn on the Hitselberger family cattle ranch, where you’ll find Hitselberger hugging all the spruce tips. He’s obsessed with spruce tips. 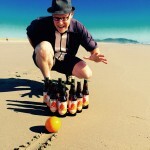 He got hooked on them while working in Alaska, and has since become the first Oregon brewer to make the style his flagship. The soft shoots that bud on Sitka spruce in the spring aren’t piney, in the way you expect of hops, but rather sweet, with citrus and strawberry notes — they make for a delicate, unique and very tasty beer. Backwoods Brewing Company and The Pine Box in Seattle collaborated on Spruce Springsteen, a winter warmer ale brewed with brown sugar, cinnamon, orange peel, and, of course, spruce tips. Inspired by the Boss, and red amber color with a beige head, Spruce Springsteen hits the nose with roasted malt, toffee and spruce, followed by notes of pine, cinnamon, chocolate, berries, oranges, vanilla and caramel. It’s smooth throughout with a velvety finish. Clocking in at 8.5 percent ABV, Dogfish Head Pennsylvania Tuxedo pale ale is brewed with massive additions of fresh spruce tips from the forests outside the Woolrich clothing factory, and its name pays homage to the red-and-black flannel-suited hunters and gatherers who dwell deep in the winter-frigid backcountry of north-central Pennsylvania. Brewed in collaboration with the outdoor clothing company Woolrich, Pennsylvania Tuxedo has a grassy citrus kick complemented by the resinous conifer notes of fresh green spruce tips. A dry, yet doughy malt backbone lets the hops and spruce shine while balancing out the bitterness, making Pennsylvania Tuxedo a classic hunting cabin sipper. 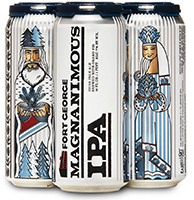 Magnanimous IPA is a yearly offering, a joint effort once again between Fort George Brewery and Earth & Sky Farm in Oregon City. Brewed with real Grand fir Christmas trees, the IPA is a straight-up ode to one of the more pungent essences of the Christmas tradition. Hundreds of pounds of fir tips were picked, packed, and vacuum-sealed into 10-pound bags. We’re not sure if “O Tannenbaum” was blasting from the truck’s speakers, but we do know the fir was trucked back to Astoria, and delivered to a dedicated chest freezer located in the basement of Fort George co-owner and brewer Chris Nemlowill’s home. It’s safe to assume the fir tips were nestled all snug in the basement, while visions of Magnanimous IPAs danced in Nemlowill’s head. When in the brewery there arose such a clatter, Earth & Sky Farm owners Tim Ensign and Jana Daisy-Ensign sprang from their bed to see what was the matter. Magnanimous IPA hit the kettles with generous amounts of hand-harvested Grand Fir trimmings and bountiful additions of Simcoe and Chinook for a noble blend of lush piney hops and fresh evergreen aroma. George and Jane Hancock founded the ma-and-pa Maritime Pacific Brewing Company in an old transmission shop in 1990 in Seattle’s Ballard neighborhood. 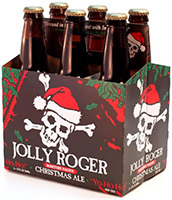 In 1997 they opened the Jolly Roger Taproom named, as they say, “in honor of our most popular holiday brew”: Jolly Roger Christmas Ale. A beer fridge staple, Jolly Roger English Strong Ale combines rich malt character with a blend of fresh Northwest Chinook and Cascade hops. Once again, Maritime gave its famous winter ale a spruce treatment. Spruce tips have been used in the brewing process for hundreds of years. They were one of the main additions in beer before people learned about brewing with hops. The fresh, tender tips have a mellow pine scent and a crisp flavor.